Founded in Italy in 1962 Neri SpA specialize in high-end outdoor furniture and lighting systems. With a presence in 100 countries Neri SpA collaborates with designers from around the world to create products that improve the quality of urban spaces. Inaugurated on the 9th of November 2016 the Dubai Water Canal provides 6.4 kilometres of waterfront space to one shopping centre, 4 hotels and no less that 450 restaurants. 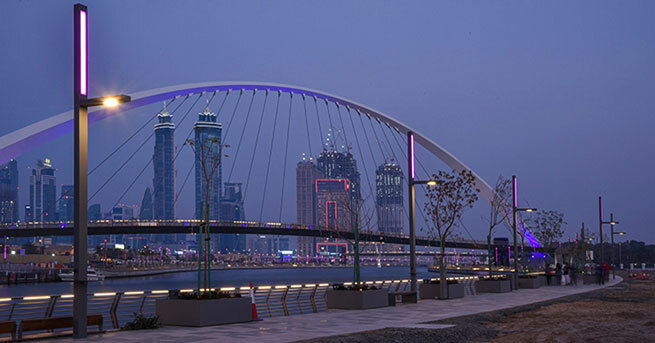 Along with luxury housing, a 3 kilometre running track and 12 kilometre long cycle path, one of the most striking features of the 3.2 kilometre long canal is the artificial mechanical waterfall at the Sheikh Zayed road bridge. A strategic part of the project was the lighting for this 80,000m2 area. As well as providing a safe nighttime environment it should also highlight the beauty and key features of this unique Arabian feat of engineering. The lighting project was entrusted to internationally renowned Greek design firm CPLD. Working with Italian lighting company Neri SpA they designed a hi-tech lamp post complete with mobile phone charging and Wi-Fi. To ensure uniform light and that all the angles necessary could be covered, Neri SpA understandably chose LEDiL as their optics partner. The canal is an amazing sight, especially at night, with an ever-changing spectrum of red, green, yellow, blue, white, violet and light blue. The landscape on both banks is constantly changing thanks to the light reflections on the water as the lights, controlled by preprogrammed timers, switch on and off. The view from the canal towards the Dubai skyscrapers is especially spectacular with all the lamp posts and their constantly changing colours; a site guaranteed to impress every one of the expected 30 million visitors a year.